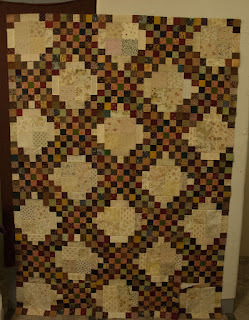 I had a productive weekend, finishing all the blocks for the Triple Irish Chain. I like how it looks on the design wall, nice and rich. 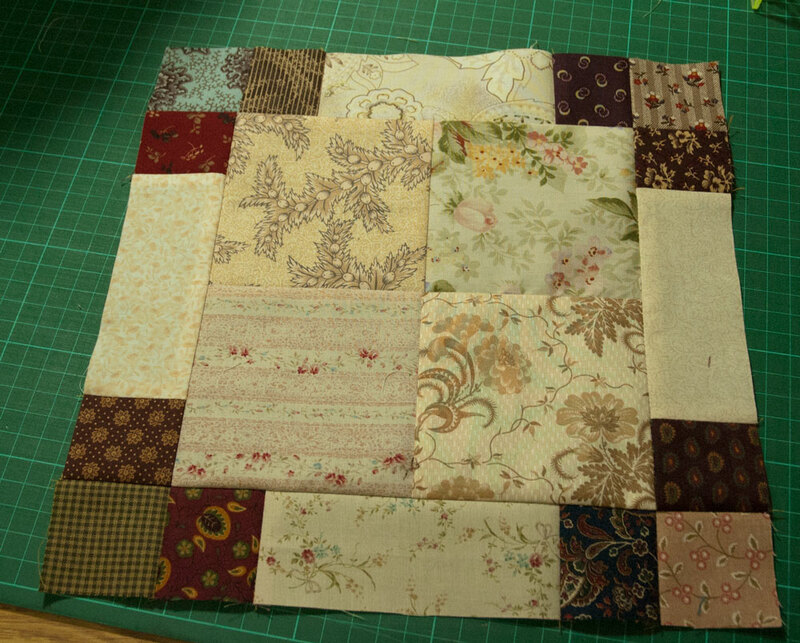 The next step is to add extra squares around the edges to complete the chains and large light coloured areas. 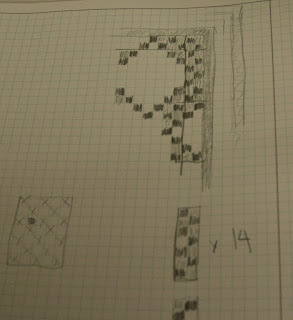 I know I could plan that in EQ7, but sometimes it's just easier to get the graph paper and pencils out. Another morning of sewing should see this in one piece, but I'm all out of 2" strips; looks like I will have to cut some from the stash drawers. The Doors and Windows blocks that I am making as leader-enders are mounting up, but there's no room on the design wall for them, so I don't know how they will look. 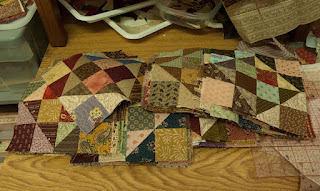 As soon as the chain quilt is done I'll be putting these up and seeing if the colours are right; they seem rather sombre right now, I may have to add a few happier fabrics to the mix. 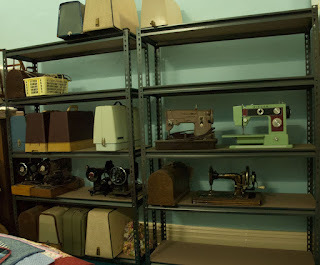 During the week Mereth and I had fun putting together some very sturdy shelving to hold my sewing machine collection. I don't think I'm normal, I get far more happiness from metal shelving than shoes or makeup or jewellery. It makes my heart glad every time I see all my machines in their new home. My internet has been even more erratic over the past fortnight, and rather than struggle with it, I've just ignored the computer except for business stuff. It's amazing how much time that frees up for things like sewing and spinning and gardening and cooking, but I do miss it. I even left the computer up at the Hall, so I wasn't tempted to spend my evenings watching things struggle to download at 7kps; I've been living a pre-internet life after work hours, and it's been productive. I've done a fair bit of spinning, but no photos of that, so you'll just have to take my word for it. I finished the scrap quilt on the design wall, but no photos of that yet, it's quite large and I need to modify my design wall before it will fit up there. And I started a new scrap project. At the start of the year I said I wanted to make lovely quilts this year, with my good stash, not just scrap and utility quilts. That hasn't happened at all. Most of my stash is still at the Hall, while I sew from the scrap containers at the house. 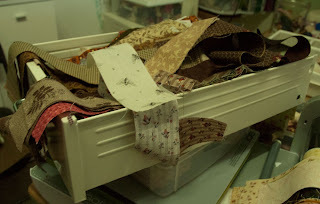 I won't be living here for all that long, and I haven't felt like dragging 30 drawers of heavy fabric into the house, so when I need to start a new quilt I just pick a scrap drawer and start cutting from it. So far I've cleared out the 2.5" drawer, and whittled down the 3.5" drawers. Last weekend my eye fell on the overflowing drawer of 2" strips, and that was it. I was off and running on another scrap quilt. 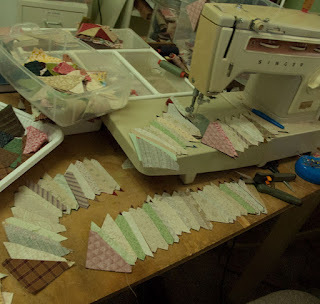 I've always adored strip piecing; from the moment I first discovered the concept I've embraced it wholeheartedly. There's not as much variety in the fabric placement, and it needs strips rather than any little scrap, but I just love sewing the strata, and then slicing it into segments. It's so quick, it seems like in no time at all there are blocks stacking up. 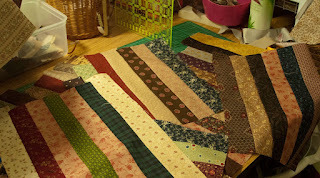 I was going to do a Double Irish Chain, but somehow I found that I had sewn the strips for a Triple Irish Chain. No matter, it uses up a heap of scraps anyway. I didn't have access to fabric to make that large square, so I made it out of a four patch, allowing me to raid the 4.5" drawer and cut those strips down too. 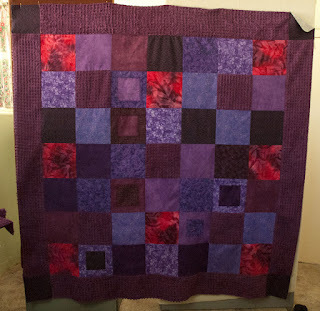 These blocks look pretty dull until the alternate blocks are added, and then it's like magic!The whole design lightens and the chains appear, marching across the quilt. 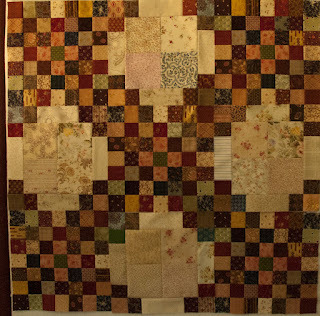 I love making chain quilts, and I love the quilting opportunities that those large light spaces offer. I'm close to having exhausted the possibilities of the scrap drawers, so I will have to decide on a 'good' quilt to make next. 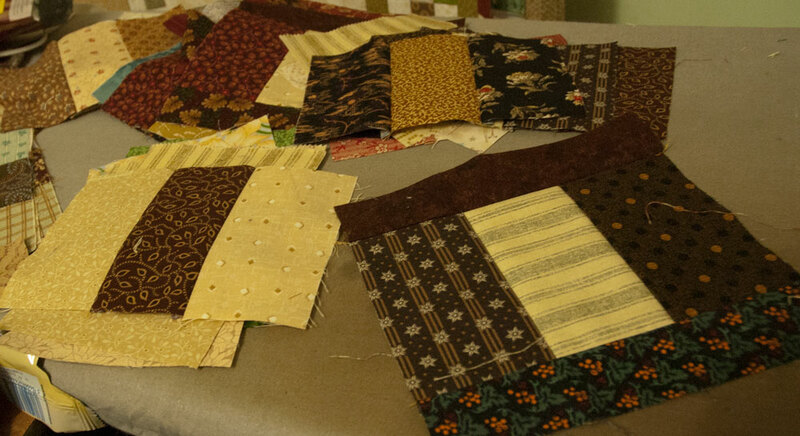 I'll cut it at the Hall, with access to all my gorgeous fabrics, and then bring just the pieces home to sew. Sounds like a plan to me. And knowing how I overcut for every project, I'll have restocked the scrap drawers in no time flat. We have a long weekend here in South Australia, for the Queen's birthday, and it's lovely to have extra time off. I really enjoy the first and second day of a long weekend, knowing there's more leisure time to come. And I've been using all that time constructively. DD Seonaid came to stay during the week, and we cut and sewed madly to produce a flannel and chenille quilt top. She did all the sewing herself, except for a couple of the final seams, which I finished yesterday. 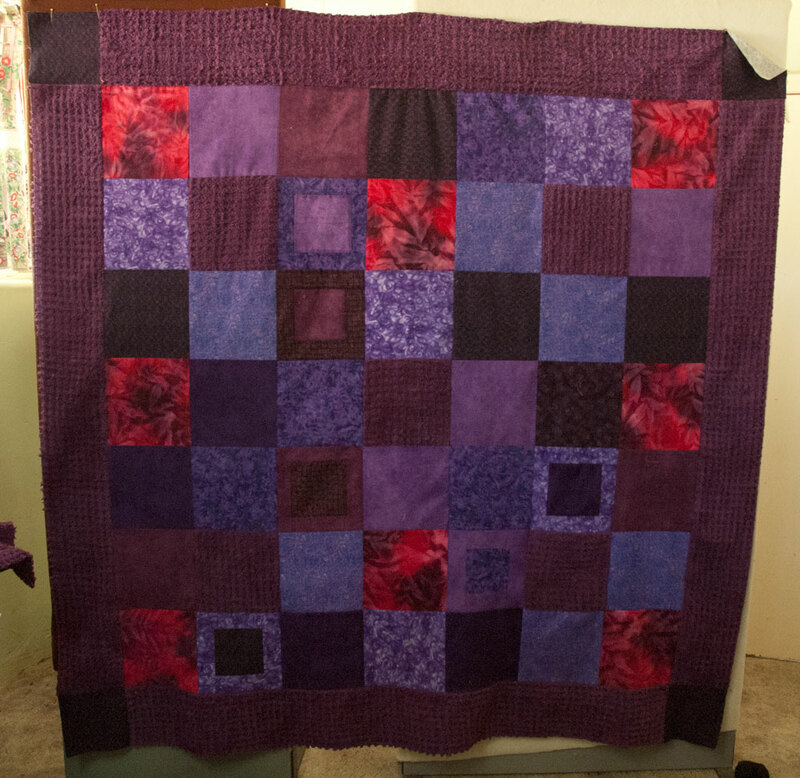 Now all I have to do is find a purple flannel back and get it quilted. I'm thinking I might be able to find flannelette sheets to use as the backing, I have to go shopping and see what I can find. I am determined to get rid of all the precut 2.5" HSTs that have been around for ages. I'm so sick of the same old fabrics, and some of them are so inaccurate; I'm used to the die-cut ones now, I love their accuracy as compared to my more slapdash cutting. I want a little pieced border for my current scrap quilt, which needed 140 HSTs, so I laid out a heap of pairs and chained them all together. 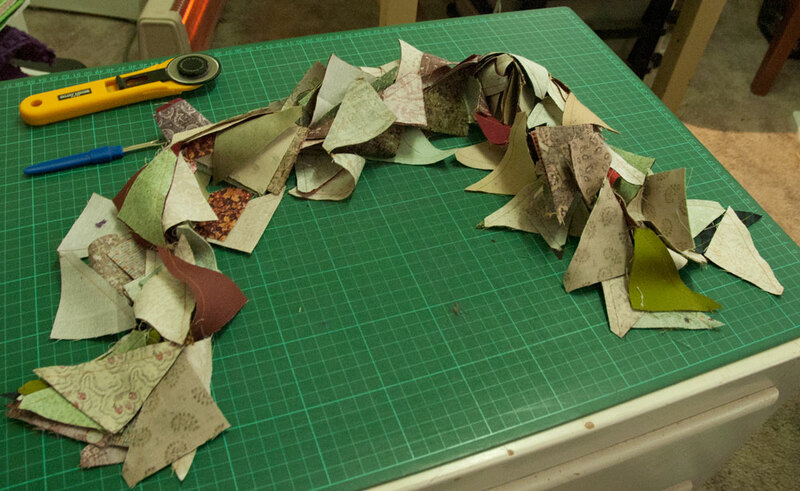 To make it easy to keep track of how many I'd made, I cut them apart in lots of 10. 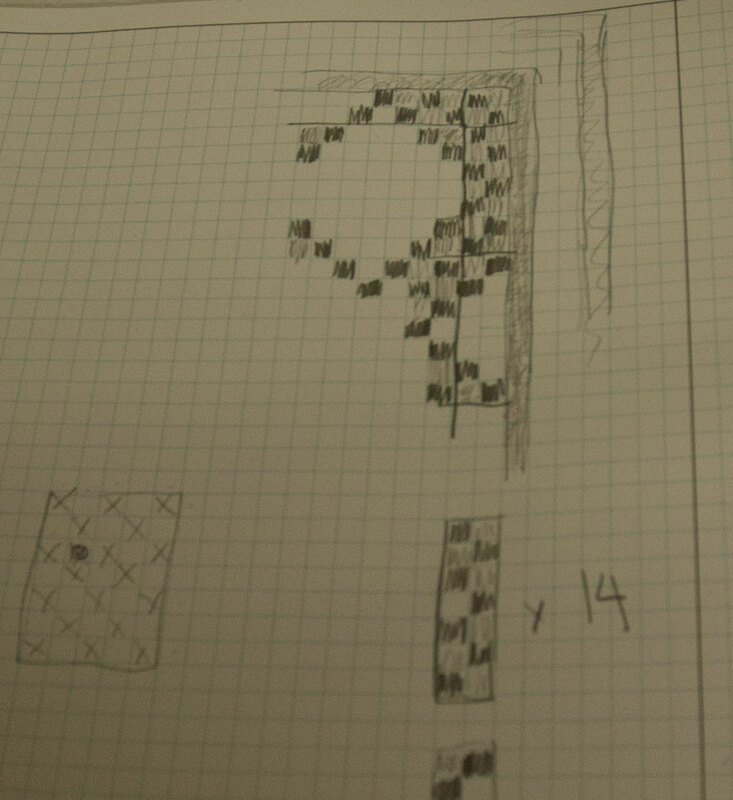 Once I had 14 of these strings of triangles, I knew I had the right number for the border. 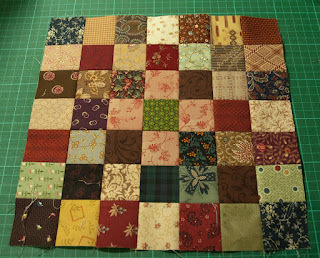 All the blocks are made, I hope to get them into one piece by the end of today. It's freezing just lately, and my house is like an icebox. The high ceilings make it hard to heat (it was lovely and cool in summer, which was welcome then, not so much now). Instead of sitting in the loungeroom with a heater on at night, I just get into bed with my computer and work in comfort. It's very green of me, doesn't use up all that electricity and Dolly gets to be under the blankets with me, which is her favourite place to be. Thank God for laptops is all I can say. 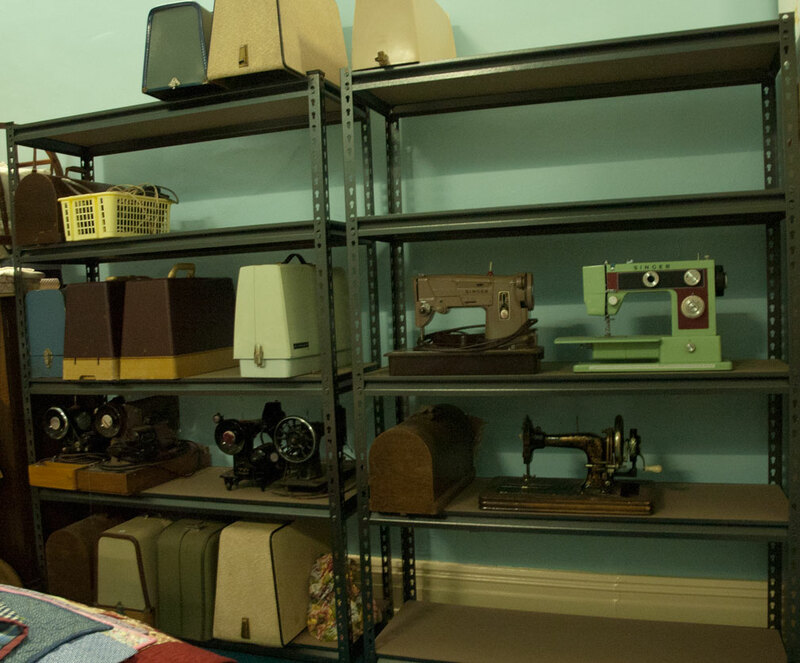 Incidentally, the heater that I use in my sewing room was bought by Mum when we were 7 years old. (You can just see it above the rotary cutter in one of the photos) I even have the cardboard box it came in, because Mum carefully packed it away after each winter. It's 46 years old, and still going strong. What a change from electrical stuff made these days. I hope I get many more years out of the dear old thing.